Norma Martinez Lozano is determined to make a difference and enrich the community where she lives. With a career spanning 31 years, she is Senior Vice President of Merger Transition at AT&T. 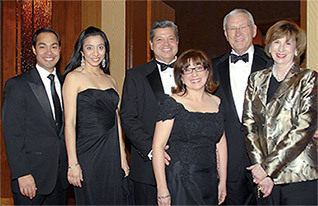 Having been appointed an officer of AT&T in 1994, Norma became the first Hispanic to be appointed an officer of the former SBC Communications, now AT&T. It is her family that has been the most positive and strongest influence in her life, and she continues to promote the traditions and values passed on to her by her parents. “They instilled the values of family, education and helping others to succeed,” she says. Her father, Juan Martinez, worked for John Deere as a mechanic for 30 years and also farmed cotton and grain. Her mother, Epifania Martinez, was a housewife and called herself a “domestic engineer.” Norma watched her parents make great sacrifices so that all three of their children would graduate from the University of Texas at Austin and pursue professional careers. Being involved in the community has always been one of Norma’s passions. She is proud to have served as the 2010 Chairman of the San Antonio Hispanic Chamber of Commerce, the first Hispanic Chamber to be founded in America and one of the largest in the country. “It is an honor to work with a great Hispanic Chamber staff and an outstanding board of directors that have a common vision and passion for our children, our community and the growth of our city,” says Norma. Under Norma’s leadership, the Chamber and the board of directors have implemented innovative educational initiatives and have strengthened the support for small businesses. The Chamber introduced its first ever Small Business Symposium to help small businesses grow and prosper. Under Norma’s guidance, it also held its inaugural women’s awards event to honor women who are “unsung heroes” and are quietly and notably making their mark on the world. The Chamber, with the support from an AT&T grant, held its first CORE4 College and Career EXPO to encourage and inspire students to graduate from high school and college, and increase interest in the STEM fields. With more than 4,000 high school students in attendance, 100 universities and colleges, 50 STEM exhibitors, and keynote speakers Bob Ballard and Bernard Harris, it was noted as the largest science event in San Antonio’s history. Norma also serves on the St. Mary’s University Board of Trustees and the University of Texas at Austin Advisory Council for the College of Natural Sciences. She is a board member of the Free Trade Alliance, the Harlandale Education Foundation, and the Boy Scouts of America – Alamo Area Council. She is also an advisor to the Hispanic/Latino Employee Association of AT&T.